Häfele supports your business with industry-leading distribution and logistics solutions. We are committed to providing distribution solutions that add value to your business and efficiency to your supply chain. Our network of domestic distribution points, combined with our expertise in fulfillment and shipping logistics ensures product availability and expedited delivery to destinations across the US. In most cases, customers can expect to receive their orders in 24 to 48 hours. 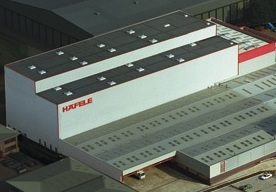 Häfele America operates distribution centers in Chicago, Dallas, Pennsylvania and Los Angeles, and at our corporate headquarters in Archdale, NC. 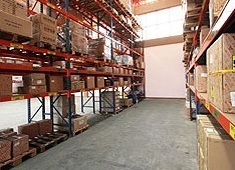 Through these state-of-the-art facilities and our advanced Warehouse Management System, we’re well prepared to meet the most demanding delivery requirements. 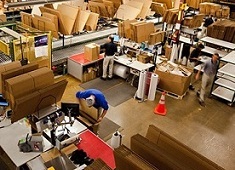 From same-day order processing and just-in-time delivery to customer pick-up and customized packaging, our distribution services provide the flexibility and dependability your schedule needs. Distribution logistics is an important part of our customer service. We work hard to choose the transportation method that best suits the volume, dimensions and destination of each shipment. We consider factors such as urgency and distance, and do all we can to assure that orders arrive – damage free– in the right place at exactly the right time. Our registered customers can easily track their shipments online during transit. Häfele is a C-TPAT (Customs Trade Partnership Against Terrorism) partner with Customs Border Protection. We strive to follow all import laws and regulations to ensure a secure supply chain. Our Quality Management System ensures customer satisfaction throughout the production process. We received our ISO 9001:2008 certification in July 2009. Prior to that we were certified to ISO 9002:1994 in 1996 and ISO 9001:2000 in 2003. This history of certification provides independent verification that Häfele has long been a quality conscious company. Our focus on quality comes naturally. German precision – especially in engineering and manufacturing – enjoys an outstanding reputation around the world. This attribute is at the heart of the Häfele brand. In the US, our goal is to meet and exceed the highest quality standards for all the products and services we provide. See more about our Quality Management program. At Häfele, we’ll match our shipping schedule to meet your ongoing need for materials. Our attention to just-in-time delivery allows customers to reduce the costs – and stock-out risks – of maintaining an inventory. We’ll work with you to schedule deliveries that assure a minimal, practical on-hand inventory. Hafele’s just-in-time services also help minimize the need for financing, storage, and insurance.